My clammy left hand was clinging to a weathered cliff face. In my other hand I clutched my hiking pole but I had nowhere to plant it because to my right was nothing but air and a long drop into the Pacific Ocean. Just when I needed them most, my legs had turned into overcooked pasta. I can’t trust them, I thought, to take this next step. A step with no margin for error. 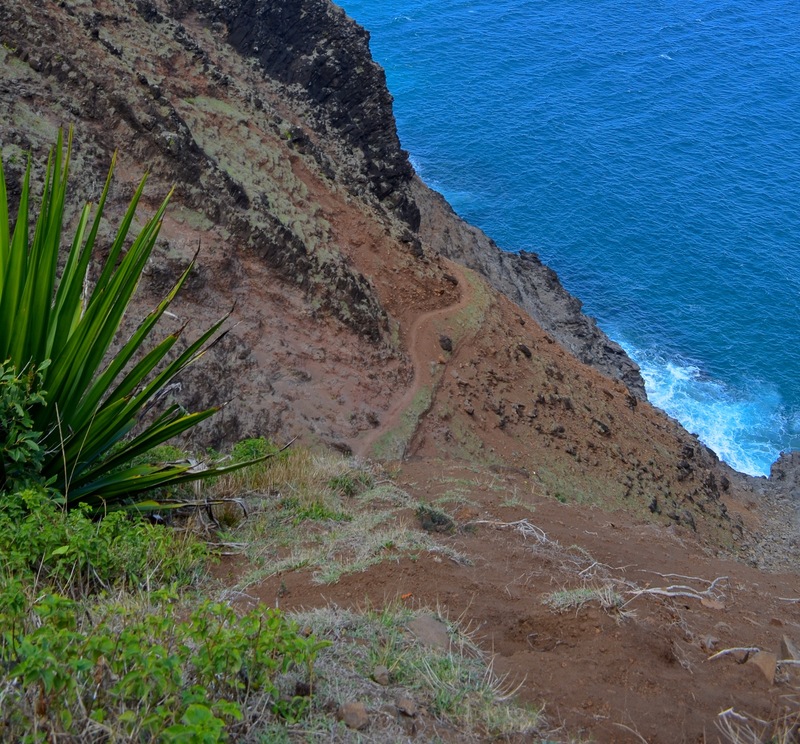 My hiking partner and I were seven miles into the Kalalau Trail, a challenging hike that winds its way along the rugged Nā Pali coast of the Hawaiian island of Kauai. Before me was Crawler’s Ledge, an exposed rock balcony wrapped around an intimidating precipice. At parts the ledge was but a few inches wide. I’d known this moment was coming and I’d been dreading it all day. The route so far had been gruelling – we’d climbed over jumbles of slick, ankle-breaking rocks, crossed two rivers and walked up and down endless switchbacks on a thin, crumbling path that seemed to erode beneath our very feet. In return for our efforts we’d been treated to stunning views of the unique Nā Pali geology – great green colosseums carved out by rivers and lush with vegetation, steep peaks sculpted by the trade winds into fluted spires and, never far away, that tortured coastline forever pounded by an ocean working to slowly return the island back to its depths. The climate had cycled at every turn of the trail – blazing sun or humid mists or sudden torrents of rain. Rainbows pounced out of nowhere, plunging through the hazy air, over the crumbling cliffs and into the endless expanse of ocean. Waiting for us at the end of this captivating trail was a mile of pristine, postcard-perfect sandy beach and, behind it, the fertile Kalalau valley, with its laden fruit trees, its caves, streams and waterfalls. Surrounded by dramatic, unscalable crags, Kalalau is isolated and cannot be reached by car, nor even by boat for much of the year. It is a place many have described as a paradise and which a few, wanting to escape the trappings of modern society, even call home. But here I was, cut off from paradise by just a few steps. Steps that were, my logic told me, not particularly difficult – except for the knowledge that a slip would mean a long fall into the unforgiving surf below and certain death. Oh, and the fact that I’m renowned amongst my friends for my clumsiness. My legs were weak and tingling and the cumbersome weight of my backpack was throwing me off balance. Strong winds buffeted me, ripping off my hat and turning the bin liner covering my sleeping mat into a billowing sail. My vision had narrowed to include only the terrifyingly narrow catwalk before me and all I could hear was the booming of the waves pounding at the base of the cliff. They sound hungry, I thought. I looked up at my husband, my hiking partner, to tell him that I couldn’t go on. He had negotiated the worst part and had found a precarious perch to balance on so he could turn and look back. He shouted something but the wind tore away his words. Suddenly, something in me shifted. If he can do it, I thought, so can I. The last thing I wanted was to have to tell the story of how I wussed out in the middle of the Kalalau Trail. Taking a deep breath, I turned to face the wall and grabbed hold of it with both hands. With my body pressed as close as possible to the cliff, I slowly, awkwardly, crab-walked my way along the uneven ledge until it finally widened just enough to be able to walk normally. A short scramble over some rocks and we were clear of Crawler’s Ledge and what a moment ago had seemed an unsurmountable obstacle. I now had the courage to look around. The sight of the sea and cliffs, so menacing before, was beautiful and I felt invigorated. I’d conquered my fear and nothing this trail could put in my way was going to stop me now. A few hours later we forded another river to arrive at our destination. A woman in a flowing dress, who was picking some greenery in the shallows, pointed us towards the campsite. “Welcome to Kalalau,” she said, smiling dreamily. After pitching our tent we headed to a nearby waterfall to bathe our aching bodies. As the pure, mineral water flowed over our hot skin I began to think about the way back and facing Crawler’s Ledge for a second time. It was still a terrifying prospect, but now I knew I could do it. So there it is! If I could go back and fix anything about the piece before submitting it, I’d definitely change that cheesy ending! If you’re like me and researching Crawler’s Ledge before taking on the trail, I hope this didn’t put you off! Many people don’t find it as scary and it’s comforting to know that none of the thousands of people that have attempted this ledge have actually fallen off it (as far as I know anyway!). The ledge is solid rock and so probably not actually as dangerous as other parts of the trail that are muddy or crumbling away, it’s mainly the sheer exposure of it that makes it daunting. Just be aware of the dangers but try not to let the fear take over. On the way back I was stressed but resolute because I knew I didn’t have the option of turning back. It meant I moved through the ledge section quickly, with more focus and less trembling! If you’re embarking on the trail, check out KalalauTrail.com and the active Kalalau Trail facebook group, which is a great place to ask any questions you have. You can also read my other Kalalau post.